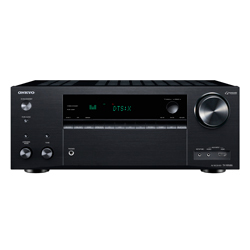 The Yamaha RX-V585BL has a pretty acceptable total harmonic distortion rate – 0.08%. Moreover, its total output power reaches the 560W, while the output power per channel – only 80W. 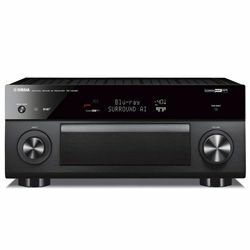 The front side of the receiver’s box contains the most commonly used inputs and outputs: scene choosing buttons, USB/AUX plugs, the tone/volume controllers. The upper part of the device has a deep-black glossy surface with a bright display. All the inscriptions are clearly visible despite the level of lighting in the room. The device has small dimensions (12.4 x 17.1 x 6.3 inches) so it is easy to put it where it pleases. The remote controller is well-looking and pleasant in the use. 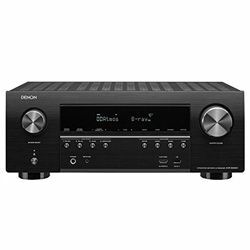 I’m glad to see the Yamaha RX-V585BL has Dolby Atmos and DTS:X capabilities. Furthermore, it is supplemented by the Cinema DSP 3D software that is a special development of the company. With its help, I have an opportunity to enjoy the acoustics of real concert halls. All the popular services (Spotify, Deezer, Qobuz, Pandora, and Napster) work without problems and their updating bring only improvements. The built-in clock and sleep timer are also the part of the system and they perform their direct tasks greatly. The receiver has a 4K Ultra HD HDMI support, so the picture on the screen is really incredible. It works without a noise, but the unit can reboot unintentionally from time to time. Perhaps, the reason for it is an overheating or overloading, but such a peculiarity makes me nervous. The device has Bluetooth and Wi-Fi but the last feature works with interruptions. The music streaming may intermit at any time. In such cases, I start to perform the same process via Bluetooth, which works seamlessly. The Yamaha RX-V585BL review shows that the device can produce an airy sound. Extremely lofty heights are amazing. After the sonic balance reaching, the receiver starts to produce really low basses that greatly fit the rock music. The surround sound appears while movie watching and creates a sense of real presence. 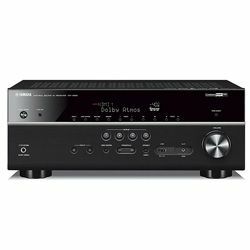 The Yamaha RX-V585BL specs are amazing, but it has only 4 HDMI inputs and 1 HDMI output. 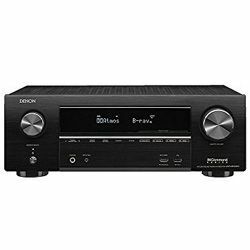 All of them perform their functions well; however, their number may be not enough for audiophiles and those people who want to use the device to its fullest extent. 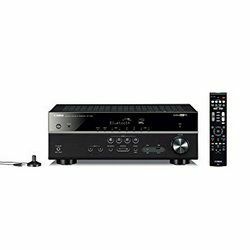 The manufacturers added also 7 AV inputs and such a peculiarity is encouraging, especially when I understand that all of them read information instantly. 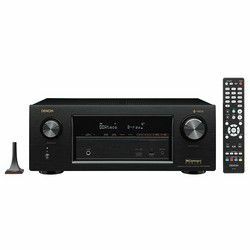 I’m glad to see the Yamaha’s YPAO presence but such a technology requires more adjusting efforts than Audyssey or Sony’s DCAC EX. While the setting process performing, I always ask for help the online manual. The on-screen guide blurry presents the information and I can’t understand many moments. 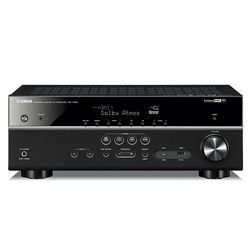 The Yamaha RX-V585BL is a great receiver for those people, who want to enjoy the streaming services, amazing sound, and HD videos. It has a lot of inbuilt decoders and actual functions to become the high-grade entertainment device.